Who Should Buy a Garbage Disposal? How To Make Sure Having A Garbage Disposal Is A Good Idea? 1. Does your community allow individual garbage disposal units? 2. Is Your Septic Tank Capable Of Handling The Waste? 3. Is Your Plumbing Up To It? 4. Would A Garbage Disposal Be Good For You? What Can Or Cannot Be Ground With a Garbage Disposal? 2. How to clean a garbage disposal? 3. How to prevent bad smells? 1. 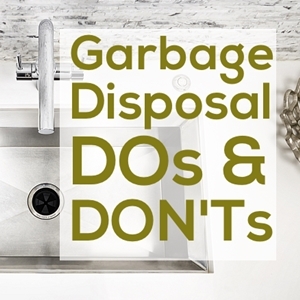 What kind of items should you avoid putting in the garbage disposal? 2. Should I use hot or cold water with my disposal unit? 3. How often should I clean my garbage disposal unit? 4. Who do I call to repair the garbage disposal unit? 5. How powerful are the garbage disposal units? 6. Can I hurt myself using the disposal, and how dangerous it is? 7. How loud are garbage disposals? 8. What kind of accessories should I purchase, and are they expensive? 9. Can using a garbage disposal unit clog my pipes? Have you ever thought about investing in an essential device for your household? Well, as it turns out, there is a contraption that is multi-functional, even though it does a simple job: chopping down your food leftovers. Believe it or not, as of 2009, more than 50% of households and apartments in the United States have it installed – yes we are talking about the best garbage disposals. Regular garbage disposal is more than important nowadays, because it does a great service to the environment, all the while helping you dispose of extra leftovers. It is a win-win situation. In the following section, we will analyze some of the waste disposals, what to expect, how to install and use them, and what to avoid while using them. Getting all the info you need will be available through our detailed garbage disposal reviews, so make sure to check it all out. 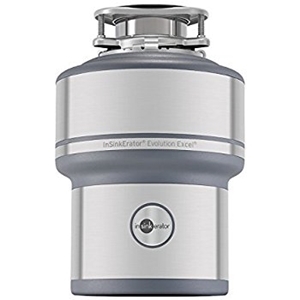 First off, let us start with a really popular model, the InSinkErator Evolution Excel. 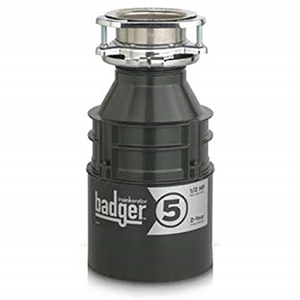 This modern-looking garbage disposal unit uses cutting-edge technologies to make the disposal processes as effective and ergonomic as possible. Even though you will not look at the unit so much, its modern design fits into any kitchen, due to its metallic finish and steel vibe. This model packs a powerful punch with the 1 HP motor, which is considered really strong in the game of garbage disposals. There are multiple technologies mixed in this unit when it comes to chopping. Besides the mentioned 1 HP Dura-Drive induction motor, there is a MultiGrind technology included, which consists of three levels of grinders. This allows the unit to grind up the majority of any food waste. Additionally, there is a 40 oz. stainless steel grind chamber surrounding the grinding area, allowing it to have a better flow, hence lowering the chance of choking. Last, but certainly not least, the SoundSeal system makes it incredibly quiet, delivering great results within minimal noise levels. This manufacturer, with a charismatic name, brings a lot to the table in the field of garbage disposal units. Their models are usually easy to install and set up and require little to no professional assistance. 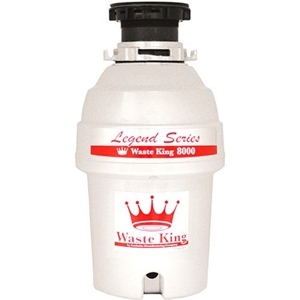 Waste King introduced the EZ Mount, which allows you not only to install it with ease but to clean it conveniently as well. This particular model is powered by a high-speed ½ HP motor, working on 2600 rpm and 115V, which helps it get jammed far less frequently. The body is made out of stainless steel, further prolonging the durability. Activated by a wall-switch, this unit belongs to the continual disposal models, and it comes with a built-in power cord. This may not sound like a lot, but many manufacturers do not include one. This highly affordable model is ideal for a 1-2-person household, or a 2-4-person household with moderate dietary habits, which cooks 2-4 times a week. Now comes the model form the people who popularized the garbage disposal we know today. The GFC320V is powered by a 1/3 HP permanent magnet motor, that operates on 2500 RPM, which is quite a lot considering the horsepower. This motor system developed by GE is made of galvanized steel and stainless steel, which prolongs its life. The blades are set into two levels, the main level, and the pre-cutter level, enabling more thorough grinding. The whole motor features an advanced insulation package, lowering the noise, hence making the usage user-friendly and noise-free. 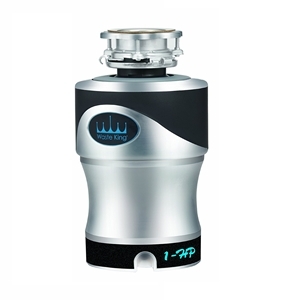 Being that it is a compact continuous feed garbage disposal, the manufacturer suggests letting water flow 10 seconds before and 20-25 seconds after the use, in order to get optimal results, and lower the chance of potential jams. Next up, we have a slightly less powerful, yet solid and more affordable model: The Essential XTR. Now, when we said slightly less powerful, it is actually not that big of a deal. This stainless steel, high-tech looking model, has a ¾ HP Dura-Drive induction motor, which is more than enough to tackle any task you might have in mind. Using stainless steel is always welcome, keeping in mind that a lot of water goes through the unit. This particular model has a system of two grinders working together, packed as the MultiGrind technology. In comparison with the previous model, this one has a somewhat smaller capacity of 34.6 oz. which is more than enough for regular needs. On top of it all, this model comes with the Satin Nickel sink top switch, which definitely enables you to fit it into your kitchen better and to have better control of the unit. Following up, we have a significantly more powerful Waste King model. 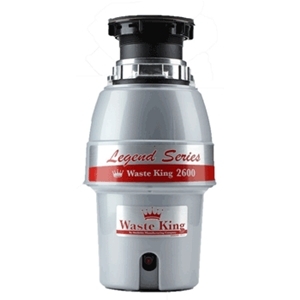 While it is also a continuous type of garbage disposal, this particular unit has a low-amp 1 HP, 2800 RPM permanent magnet motor. This essentially means that the motor of the unit is set up to jam as less as possible and that it helps reduce the overall noise. As mentioned before, most of the models from this manufacturer have the EZ Mount system which allows easier installation, and this unit is no exception. This continuous feed garbage disposal is activated by a wall switch and grinds until stopped by a said wall switch. The unit itself is quite lightweight, despite the fact that it is made of stainless steel, and the electric cord is pre-installed, making the set-up even easier. And the motor itself is permanently lubricated, thus prolonging its lifespan. Next up, we got a garbage disposal unit manufactured by a company which is quite competitive in the world of plumbing accessories. Their unit is powered by a ¾ HP electric permanent magnet motor, that spins at 2,700 RPM. It is a continuous type of disposal, and its motor is a Vortex type, a system developed to work as a power tool. Their unit comes provided with an electric cord, eliminating the need to hardwire, and the model alone fits on any 3-bolt system. Atop of this, there is a Universal Xpress Mount, making it even easier to install and mount. In regards to other models we talked about, this one is designed to look minimalistic. Being painted in plain black gives it an extra feeling of professionalism. And above all, the unit is equipped with a sound shield, which absorbs a lot of the noise, making the model pleasant to use. This unit from InSinkErator is the most affordable, considering its performance-to-price ratio. 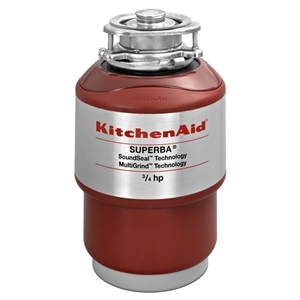 Powered by a ½ HP Dura-Drive induction motor, it will cover all the basic needs you might have in the kitchen. But keep in mind that it is not made for a lot of food traffic down your drain. The induction motor, however, has a Manual Reset Overload option, which is built in it in order to make it last longer. The grinding system alone is made of extremely durable galvanized steel, which is a great feature long term. Do not let the smaller size of the unit fool you, it will still get the job done. The capacity of the grinding area takes up a total of 26 oz. The model doesn`t come with a power cord, however, the manufacturer provided a 1-1/2-inch Anti-Vibration Connection in the form of a hose clamp, to help you secure the drainage. The Badger 5 prides itself on being extra environmentally friendly, using only 3-4 KWh annually. This is incredibly low considering how much energy appliances use nowadays. The next model from Waste King is indeed on the strange looking side. Its futuristic design matches the powerful punch of 1 HP. This powerful motor has a single chamber with corrosion-proof layers, for a longer lifespan. It is quite strange to have a single grinding system, but the manufacturer guarantees that it is enough to challenge the unit with any garbage in need of disposal. This continuous-feed disposal model is made mostly out of steel and is a bit heftier than the other models from its family. And what makes it partially different from the other models is the absence of the EZ mount system. However, this model has a 3-bolt mount system, which fits all the matching systems under the sinks. The Knight comes with a 36-inch long, built-in electric cord, which also helps you install it with ease. The long cable compliments the Snap and Lock mounting system. 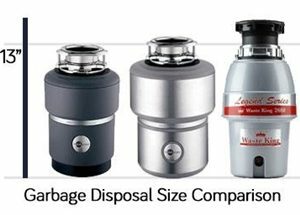 The world renown appliance manufacturer has its own garbage disposal model to compete in this type of market. Their GC2000XE unit is a continuous feed, stainless steel model, powered by ½ HP permanent magnet motor. The unit itself looks quite industrial and sturdy and is somewhat heftier than the ones we already mentioned. The parts are made of stainless steel and galvanized steel parts, which keep it rust-proof for a long time, and there is a provided steel sink flange with a 1-piece plastic stopper, which makes it more convenient to use and clean. And to make things even safer, there is an automatic stop system, with a reset button, so if there is a mishap you can stop and quickly fix or grab the item that fell into the sink. Additionally, this unit is also super easy to attach and bolt on standard types of sinks. The last model from InSinkErator we are going to analyze in our list is the Evolution Cover Control. The model itself can be considered a combination of every previous model we mentioned. It is powered by a ¾ HP Dura-Drive induction motor, which is more than solid for the average kitchen. The two-level MultiGrind system is surrounded by a 40 oz. chamber enables longevity and more economical consumption of water to wash down the food remains. This unit also has the SilentSeal technology onboard, so noise will not be a problem, and you can work around the kitchen in peace. As an extra feature, this unit comes with a Magnetic CoverStart activation option, making the wall switch obsolete, and preserve more water than other models. It, of course, can be manually activated, but, as a batch garbage disposal, it will not be needed often. The last model from this manufacturer is the most compact. The L-111 Legend is packed with a 1/3 HP, 1900 RPM high-speed motor. 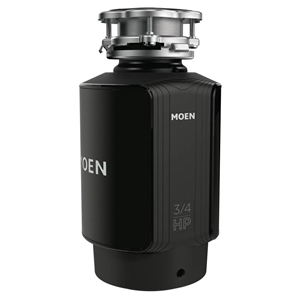 As with its predecessors, it is also a continuous feed garbage disposal, and as it is with the majority of models, it also has the EZ Mount system for easier installation. This compact model is industrial looking, and the stainless-steel parts only help it look the part. There is a manual reset button in case something unwanted gets stuck, or there needs to be a sudden emergent stop. It is activated with a wall switch or a sink-mounted air switch, which will keep the unit running until stopped. Additionally, this model has a removable and replaceable splash guard, which makes maintenance extra easy and practical. Combining these two systems, retrieving possibly stuck objects, which can happen to anyone occasionally, is easier than with other models in its class. The very last model on this list is a pretty popular model on the US market. The first thing we noticed is the industrial, yet user-friendly, reddish design. It is on the side of pricier units, but it does deliver accordingly. Powered by a permanent magnet ¾ HP motor, spinning at a maximum of 1725 RPM, which can challenge the sturdiest of food wastes. Now, being that it is a continuous feed garbage disposal unit, it does have a safety feature installed, in the form of an emergency stop. This is especially useful if something you don`t want drops down the sink while the unit is working. The last feature this model offers is the sound seal technology that works incredibly well, making this unit one of the most silent on this list. This model doesn`t come with an electric cord. As abovementioned, more than half of the United States use some form of garbage disposal. Now, what this tells us is that there are multiple benefits that a household can reap from a garbage disposal system. Some time ago, this type of house appliance was a commodity only for the wealthier. But, with the progression of technology, nowadays, these units are affordable and can be bought by anyone. The main reason people mention when getting one of these units for themselves is generally better disposal and better experience while in the kitchen. As you get the option to dispose of extra food in a quick and effective way, while not having to stop dishwashing or kitchen cleaning, you will start to see the first pay-off. Essentially, anyone with a sink in the kitchen should get a garbage disposal unit. Besides the disposal part, which is more than sanitary, you will get the experience of not stacking waste and garbage until pickup day. The important thing to emphasize here is, of course, proper use of the device. Every unit has its limitations when it comes to grinding power (more about that later), but all in all, you will be able to get almost every type of food down the drain and not worry about it. If by chance, you cook a lot and use a lot of dishes, you should definitely consider installing one of these under your sink. The whole point is to get rid of the extra waste, and not make a mess, at home or in the environment around you. Many would argue that a garbage disposal appliance is one of the most ecological investments you could make inside your home. And, after all, let us not forget one of the best features this unit can get you: smell disposal. Yes, all that nasty smell that gathered from waiting for the garbage truck will be gone. These machines are engineered to get rid of the extra food you don`t want anymore and to do it as fast as possible. You should first make sure you’re allowed to install a garbage disposal unit before you buy one. If might seem silly, but in some parts of the country, you won’t be allowed to own one. Here is what you should take into consideration before buying a garbage disposal unit. If you’re connected to the municipal water system, and your sewage goes to the municipal sewer system, you will need to contact the local authorities before you buy a waste disposal unit. The community sewer provider should give you all the information you need about the local policies that apply to sewage systems. Some communities require a special permit before you’re allowed to install a new disposal system, while others outright ban them. Multiple communities in California have banned individual garbage disposal systems due to the drought that affects the state. If you plan on using a garbage disposal system, and you’re connected to municipal sewage, make sure you read all the rules and regulations that might restrict your options before deciding on a model. If you believe your home is connected to a septic tank and you want to install a garbage disposal system, the municipality might require you to use an upgraded tank which is capable of holding the waste. To find out if that’s the case, you might have to collaborate with a local building inspector. If you’re not sure if your home is connected to the municipal sewer system or a septic tank, you should follow these steps to find out. Keep in mind that if your house is connected to a septic tank and you install a garbage disposal system, you will have to empty the septic tank more often than you did before. If your plumbing currently has problems with clogs and backups, you should not install a garbage disposal system until you upgrade it. 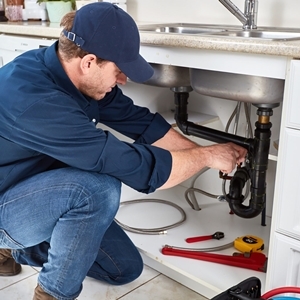 If you know your plumbing has a weak spot where clogs frequently occur, you should replace or fix it before you even think about installing a disposer. The additional waste that goes into the plumbing after you install the disposal unit can lead to additional problems, and can even lead to more severe ones. If you have problems with clogs and backups but you don’t know why they happen, you should contact a professional plumber to identify and fix them before installing a garbage disposal. This is another aspect you should think about. A garbage disposal system is not expensive, and you will probably be able to install it by yourself, so you won’t spend a lot of money on it. However, using a garbage disposal will increase your household’s water usage, and consequently, your water bill will rise. Is garbage disposal really necessary for your household? If you want to make an informed decision about how helpful garbage disposals can be, you should read the following section. When people imagine a device such as the ones we talked about lightly, they usually think about a metal fan-like contraption that chops as the food gets in. That system is over 30 years old and is far from the truth today. For example, most of the commonly used garbage disposals today use the system of lugs/impellers which are attached to the rotating part of the motor. Now, after the wanted rotation is achieved, the centrifugal force pushes the food waste you want to get rid of against the grind rings. As you might have already figured out, some garbage disposal units have 1, some 2, and others even 3 rings that help the unit achieve its goal in a faster and better way. The people form InSinkErator have demonstrated this in a concise video presentation. Also, it’s important to realize and understand that the whole unit goes between your sink and the waste disposal pipe in the wall (or sometimes on the floor) of your dedicated kitchen sink. So, naturally, there will be water coming in and out of the disposal unit, which is essential for the waste to be taken away. The crucial difference is that this way, all the wasted food and unwanted, usually organic, garbage goes down the drain and gets homogenized and ground up to fit any pipe without causing clogging or choke points. And, it is important not to forget the safety aspect, which is becoming less of an issue by the day, but an issue nevertheless. These motors, rotors, and grinders are extremely potent (being that they vary from 1/3-1 HP) and are to be taken seriously when approaching a connected unit. No matter the reason, cleaning or repairing, caution must always be paramount! Here is a great article about how these units work. This is the most typical, and by far the most logical question everyone asks. We will address this subject on several levels, as the topic is always hot, and people want to know more. 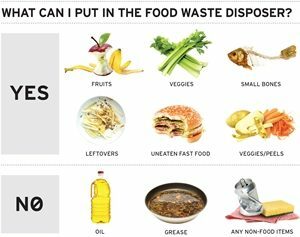 Before we go into detail and name the types of foods and ingredients that can or cannot be disposed via a garbage disposal, let`s get one specification out of the way. 1/3 HP – these units are usually made for a household consisting of 1-2 people who do not cook every day. Essentially meant for light use, with light to moderate size scraps. ½ HP – To up the game a little, these units are for medium use and are made for 2-4 people in the household. Medium use, scraps, and leftovers. ¾ HP – Reaching really powerful levels, these types of units are for medium-heavy use by 2-4 people. Leftover scraps, medium size pieces daily are fair game in this power range. 1 HP – Now we are talking about the heavy-duty power machines. Everyday use for a larger family of over 4 people in the household. Including scraps, leftovers and larger pieces in higher volumes are allowed. We will touch upon this subject a bit more when we get to the motor and horsepower part of these machines. METAL (people occasionally let a bottle cap or a piece of cutlery slip, which is really bad for the appliance, so extra caution is advised). People using garbage disposal tend to loosen up a bit and test out the unit to its maximum limits, and sometimes even over the limit. There are several reasons why you should never push this limit. First of all, if you do go over and try to dispose of something not recommended, the machine will malfunction and break. And not only will you have to contact the manufacturer and begin the fixing process, but your warranty will become void if they see (and they will) that you did not use the unit as advised. Just make sure to follow our simple guidelines, and if unsure about a specific item you use regularly, always consult the user manual provided with the specific model you purchased. You probably noticed that the majority of the reviewed models belong to the group of continual feed garbage disposals. To distinguish batch feed from continuous feed units, the answer is already in the name. Let`s quickly go through it. 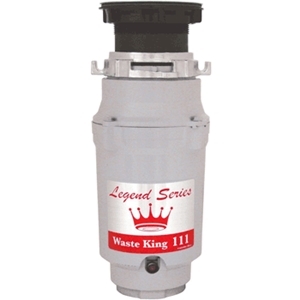 The continuous feed garbage disposal works with a simpler operating cycle. As a matter of fact, there is no cycle at all. It will continuously work when you turn it on, and it will stop when you flip the off switch, simple as that. These are often more affordable and more desirable for larger volumes of everyday use, and families tend to use this type far more often. However, keep in mind that in the case of dropping something unwanted down the drain, the damage will most certainly occur to some extent, and there is always the risk of injury, being that the unit is constantly working and grinding. On the other hand, batch feed units are for the smaller volumes of garbage and leftovers. This is due to the cycle system, in which you need to wait for the tank to fill, so the “batch” can be ground. The option of batch feed is often not recommended because food rots and smells happen a lot more frequently. On the bright side, you cannot drop anything unwanted inside, and in the case, you do you can get it out far more easily. So, we talked about power and the potential each horsepower brings to the table. These 4 levels of horsepower (HP) represent the vast majority of garbage disposals out there. That being said, one common rule applies: the greater the power, strength, and size of the unit the more food can get processed. It is actually quite intuitive. If you use your kitchen only occasionally and do not cook as much, well maybe you should consider a 1/3 or 1/2 HP model for your household. These types of disposals are reliable to the extent that they will get the job done at a reasonable rate, and the maintenance need is almost nonexistent. They will fulfill the need for a household for up to 4 members, with moderate use and no heavier output of waste in the sink. But, if you are interested in getting a garbage disposal unit that will be used regularly, think about getting a 3/4 or 1 HP unit. These powerful units, especially the continuous feed ones, are made to handle a significant load every day and will get the job done at any cost. Keep in mind that these units, however, use up a lot more of electrical power, but deliver a mightier punch nevertheless. With greater power comes greater noise. That is the way to think when picking a unit for your home. Various units offer various sound muzzling technologies, and the ones we tested out proved to be fairly quiet. After all, the garbage disposal unit is hidden under the sink in a closed compartment almost all of the time. It is true that the more HP the unit has the more noise it will produce, but the manufacturers are usually aware of that fact and will provide extra layers of sound isolation. If the noise level is a specific concern for you, considering the next couple of factors may be of great aid. While operating the noise often comes from other sources, rather than the motor of the unit directly. Remember, this machine uses high rotations per minute to do its job, so vibrations are transferred to the material around it. And with every single loose bolt or screw on your sink, the noise can be amplified by a large amount. With this in mind, it is always important to check the installation of your kitchen sink before latching on the new garbage disposal unit. Additionally, as the units get older, they tend to make more sounds that people generally describe as `clucky`. As this happens often you can affect the situation by using your unit properly and by maintaining it as the manufacturer described. All of the models have some kind of sound protection, and if the noise is the problem, investing a few bucks more to get rid of that small, but a significant problem, is absolutely understandable. This is a matter of pure logistics: always measure how much space you can afford under the sink for the cleaning unit. People tend to oversee this small, yet a significant specification, which often represents more of a nuisance than a real problem, but creates a halt nonetheless. Here are a few things to consider when it comes to the size of the unit in order to avoid the most common problems. Before making a final decision make sure to measure out space where the disposal unit is going to be mounted/bolted. This is especially important for those of you that are getting a unit for the first time. Measure the space, and compare it to the ones in the unit’s description, although people generally decide to take a small garbage disposal unit most of the time. More powerful units are somewhat bulkier and tend to take up more space than the less powerful ones, but this rule has some exceptions, so doing a little more research will go a long way. These units usually do not heat up because of the water running while they operate, so you should not worry if you use the extra space in the lower cabinet as storage. When we talk about waste type convenience, what a particular unit can or cannot process, we take several factors into the equation: horsepower, unit processing type (continuous or batch) and size. As we talked about it before, the more power the more convenience and less struggle. But, if you get yourself a batch feed disposal, you will be saving a lot of power, with the restriction of having less raw organic material processed (because of the wait). On the other side, with a continuous feed garbage disposal, you will have the option to work around the kitchen and use the unit the whole time. 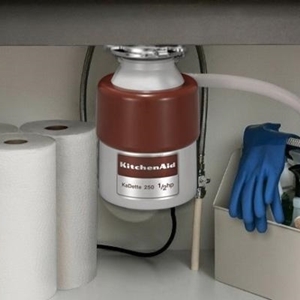 Being that it is cleaning or cooking, the disposal is at your disposal and will meet your needs. Small leftovers, peels, and crumbs are being processed as soon as they get into the sink. The downside is that you will have to utilize a lot more power for continuous work, and a lot more water. Every manufacturer of continuous feed units recommends having a steady water flow while the unit is on. Essentially, you will be able to get the best out of your unit as long as you know what to look for. That is the exact reason we are delivering this guide to you, to keep in mind even the smallest things. If you paid attention when we were going through the models in one of the upper sections, you surely noticed that some models come with an electric cord, and some do not. One way to explain this absence of an electric cord is the wide variety of kitchen types and electric installations. There could not possibly exist a cord to fit the needs of every user. Some brands tend to include a really long cable with the unit for the convenience of easier installment, but after all, getting a cord that suits the specifications of your kitchen is the best way to go. Having extra wiring below the sink, or even worse, having a cord too short that it cannot reach the socket, is money thrown down the drain. Always consider measuring and getting an adequate garbage disposal power cord for the model you are getting, or if the manufacturer provides one, make sure it can reach the desired socket. These types of appliances deal with sanitary situations, food, and inherently the health state of a household. That being said, they are made to last and are made to be as sturdy as possible. With that in mind, the manufacturers of garbage disposal units are covered with long-lasting warranty polices than usual. Ranging from a minimum of 2 and a maximum of 7 years of warranty you will be covered through thick and thin because you will use a garbage disposal every time you eat at home. Because this is a type of popular appliance, many of the manufacturers have licensed workers who will come to your home and check and/or repair your device. Just make sure not to violate the warranty agreement put up by the brand, and you will be fully covered. 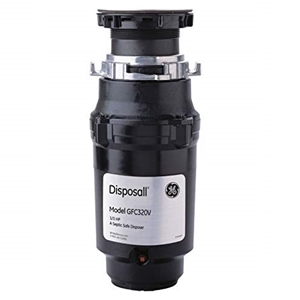 Garbage disposal units, in a nutshell, are not complicated, they do not possess many clunky parts, so you should not be experiencing malfunctions very often. Because meddling with the unit outside of cleaning tasks can cause your warranty to be void, it is better to let a trained professional do the analysis and repairs. The build of these units progresses as technology does. Every unit we reviewed and tested was made with cutting-edge materials, being it galvanized steel or regular stainless steel. This contributes a lot to the longevity of the units because, after all, we use it with water all the time, and they must absolutely stay rust-free. Also, as an additional feature, some manufacturers build extra layers of sound protection. Sometimes in the form of a tightly packed unit, sacrificing capacity a bit, and sometimes with added rubber stabilizers. As we already said, the noise source is usually mostly coming from the materials surrounding the unit, not the unit itself. One of the most important built-in features to look for in a garbage waste disposal unit is an auto stop or auto reverse button. This feature shines when it comes to the units that are used a lot. It`s logical when you think about it. People who use their unit on a daily basis tend to lose and drop objects not belonging in a garbage disposal. Things like rings, jewelry, cutlery, broken glass and similar are not that welcome. So, the option to quickly stop and/or reverse the last moment of the process might just save you the precious object or simply prevent damaging the unit. 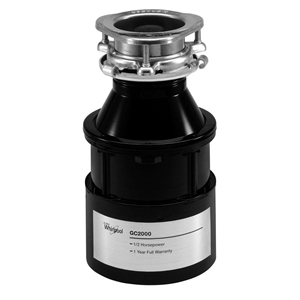 If you are getting your very first garbage disposal unit, setting it up appropriately is of the utmost importance! There are several ways you could do it, one of them is calling a plumber to do it for you. However, if you decide to do it yourself, please follow these generalized steps, double-checking and making sure that you do not miss something because, after all, you will work with water and electricity, and we all know they do not like each other. Unpack the unit and make sure all of the parts are there. Check twice, put them all on display and within reach. Before the installation begins, make sure that your sink is clean and that the power outlet you want to use is cut off at the circuit breaker. Now, disconnect the drain pipes and remove the sink strainer, cleaning as much as you can while you’re at it. Make sure to put a bucket under the disconnected pipes so any extra drainage doesn`t spill over the floor. Take the new sink strainer, apply plumbers’ putty and put it in the strainer slot, also put something atop of it to make some pressure as this will make the putty set faster and better. Under the sink connect all the flanges and security bolts provided by the manufacturer. It is usually coded and quite intuitive. Take a peek at the manual, the system varies from model to model. Connect the pipes to the lower side of the unit, and connect the optional dishwasher connector if there is one provided. Now connect the electric cord to the outlet with a switch and you are ready for a test run. You can consult this video for a more graphic explanation. Even though intuition tells us to reverse engineer the setup process in order to clean the unit, that is actually not the way to go. Cleaning and maintaining your unit every other week would be ideal, and we will share some basic advice on how to do it with as little effort as possible. The things you actually need to clean is the grease and hardened leftovers in the form of fibrous food or plant seeds. It is really important to remember these two things: never use cleaning agents and never, ever put your hands into the disposal. The chemicals are avoided because they can splash back out and hit your skin and/or eyes. And if you really need to reach into the maw of the unit use tongs or pliers to do it. Every step of cleaning should be done with running cold water along the way. Crushed ice mainly serves as a corrosion medium to help scrape the problematic dirt, combined with salt or vinegar we increase its effectivity. Quickly mix the ice with the rock salt and pour it inside the drain. Let the cold water flow over it and turn on the unit 3 times in 10-second-intervals. This will shake up and mix up the gathered dirt inside and help it pass through the pipes. Bad smells are something that happens to everyone using a garbage disposal, and it is a normal occurrence. Now we will go through some advice on how to prevent, and how to get a bad smell out of garbage disposal as well. If you have decided to give batch feed models a try, this will concern you more, in regards to picking continuous flow units. With batch feed types, you will have to schedule your disposal sessions and filling of the unit’s capacity in order to lower the chances of rotten smells. Also using a sink plug is quite helpful until the time for grinding comes. Use a lot of water while the unit is active, and try to avoid leaving foods like fish and eggs for too long. When using a continuous feed disposal unit, the problem with bad smells happens more often because of the leftovers that stay inside the grinder part of the rotor. Make sure to use enough water while running it to prevent it, and if you get stuck with the same bad smell for longer than a day, repeat the cleaning process, but this time using the lemon peels in the end (remember: no seeds). The lemon is here to freshen up the smell and help in keeping the unit clean. Well executed and well-timed maintenance is the best means of prevention when it comes to bad smells AND clogging. Doing repairs on your own is not advised by manufacturers, because of the risk of injury and because of causing harm to the environment. Now, that doesn`t mean that your hands are absolutely tied when it comes to quick fixing. Properly cleaning your unit will help it jam less, but if the jams happen there are a few things you can do, before calling customer service or a plumber. First thing, as with every piece of technology nowadays, is to unplug it and plug it in again. This quick fix sometimes can work with the magnetic circuit jams, and when the grinder gets stuck. Apply this solution, and if it doesn`t work, we got you covered. Almost every model has a little red button on the bottom of the body of the unit. First and foremost, you need to unplug the device or switch it off on the wall switch. Pressing this red button will reset the garbage disposal with rotating heads inside and help them reposition. This usually solves most of the problems, because these parts rotate a lot, and it is a common problem, hence the utility button. If any type of malfunction happens beyond this point, please consider contacting the manufacturer, and act accordingly. Do not let the funny name fool you. This highly competitive company is headquartered in Racine, Wisconsin. 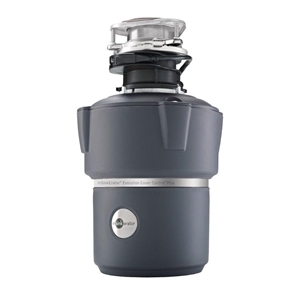 It is a business unit of Emerson and it is one of the biggest manufacturers of garbage disposal units worldwide. They are also in the game of instant hot water dispensers, but they pride themselves on the residential garbage disposal units. Their strong suit is the Research & Development department. The company employs new generations of engineers every so often, which keeps the company fresh, even though they are almost a century old. In their leadership, you can sense a strong old-school leadership style meeting cutting-edge technology development. They also lead a blog to keep DIY and home renovators informed of every new thing they did or are about to do. Having a community around the brand made of technologically enthusiastic people is important in order to push the boundaries of technology. Their customer support can be reached through regular channels in the form of landline and email, but also via modern social media channels. So, your demands, concerns, and questions can be heard whenever you need them to. Next up, we have another manufacturer with a royally funny and clever name. The work on the development of the same type of equipment as the previous brand, garbage disposal units and instant hot water products, such as mounted faucets. Existing for half of a century, Waste King keeps a bit more traditional business model, and their appliances are made to be compact and sturdy. So, if you cannot spare a lot of extra space for the disposal unit, consider this brand to suit your needs. 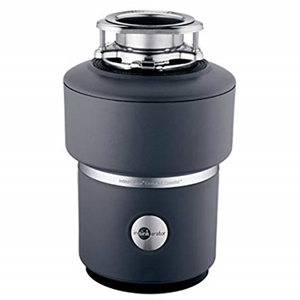 They also pride themselves on making all the necessary and optional accessories to accommodate and best fit your garbage disposal needs at home. A whole variety of colorful air switches, air switch controllers, sink flange gaskets, mount hush cushions and many more can be found on their offer. All sorts of decorative flanges and decorative drain strains are on their website. Although they insist on aesthetics, they keep the retro look most of the time. Also, on their website, you can find all of the needed documentation at your disposal. This allows amateurs and professionals alike to find all of the necessary information about their products. They encourage people to get to know their products in depth, which keeps the Waste King accountable, giving them more credibility, to begin with. Additionally, they provide step by step guides for every product and/or accessory they provide and sell. One of the biggest competitors in the electricity competition is General Electric. From steam power to nuclear power, they cover every aspect of residential, commercial and even industrial utilization. Exploring their range of products is a tiresome job. They have many daughter companies which focus on developing a certain type of products. That’s where GE Appliances comes into play. The company with a tremendous amount of experience in electronics made a branch to apply all of their patents and inventions into making home appliances with utmost efficiency. They are known for gathering input from handymen, plumbers, and electricians from all around the globe. Using said experience and knowledge they developed some of the most used appliances around the world. We took the most popular garbage disposal unit they offer and we were more than satisfied. Their website and media presence give off an engineering and scientific vibe, and that is the exact service they provide. Solving problems is their strong suit and they challenge themselves all the time. And when it comes to contacting the company in order to discuss warranty, repairs or user manuals in general, they are reachable via every media there is, traditional and modern. Now, we have a technological company known for investing in strengthening the connection between their appliances and users. They were the first company to implement social media notifications sent by their washing machine. So, when the washing cycle was over you get a notification on your Facebook or Twitter feed. That might sound silly, but it did open the door for a great number of innovative solutions in the future. As a company that makes all sorts of high-quality house appliances, its garbage disposal unit wasn’t lagging behind. We took the most popular model and were quite satisfied with the disposal results. What consumers find particularly practical and ergonomic is the smartphone application that Whirlpool provides. Via this app, you can register your products, browse similar products, find new ones you might want to consider, and maybe the best feature of all, community access. Using the smartphone app you can communicate with other customers that bought similar items. You can discuss, compare, share experiences and tips via this service, which feels like a cutting-edge feature. Whirlpool proved multiple times in history that it can stand the test of time and that their garbage disposal units are no different. Lastly, on the list of brands we considered for reviewing the garbage disposal units is a manufacturer that separate its product lines into 3 parts: major appliances, kitchenware and countertop appliances. The first group tends to be developed by a modern group of designers when it comes to the final touch, looks and feels. The devices are minimalistic, designed and support IoT systems around the globe. Being on the market since 1919, they pride themselves on being an important part of the world appliance history. They do seem to specialize in kitchenware and countertop appliances more and more, investing in the community of loyal customers around them. They plan a big rebranding of major production line designs for their 100th birthday, and they intend to take on the retro look of the good old American kitchen. Working with this brand can certainly help gear up and get every essential part for your kitchen, being it functional or purely aesthetical. After all, they cooperate with globally famous chefs and professional cooks, so they make sure to be in the know when it comes to cooking needs and trends, regardless of their plan to go retro. This is an accessory that is affordable to anyone and can be found in many shapes and sizes. Stoppers are something that every user of garbage disposal should consider in order to be completely safe from injury and/or loss of precious items duo to slippery dishes and wet hands. Stoppers are usually bought in a universal one-fits-all-size, and do not need any extra attention to be used. They are especially useful in combination with continuous feed models and should be utilized in every washing session. There is absolutely no downside to it, and the potential mishaps that it stops making it an invaluable piece of simple equipment for your kitchen sink. You will definitely thank yourself when the spoon or a fork drops down the sink and the stopper is there to prevent the grinder from being permanently damaged. As the name suggests, splash guards are there to prevent any dirty water or waste going back up the drain during the powerful process of grinding the garbage. They are often made of sturdy vulcanized rubber, and they go onto the sinkhole. What splash guards essentially do is narrow down the hole of the sink and put some splash breaking teeth and mini holes to help prevent the reflux of water. Splash guards, however, have another, often overseen feature. And that is the muzzling of the sound. The thick and sturdy rubber makes it a great sound insulator, further reducing the noise of the unit. So, getting one is a win-win situation. When we say sink adapters, a whole spectrum of accessories can come into question. Usually, kitchen sink adapters represent a combination of the first two accessories we talked about above. They can be a noise muzzle, a splash guard and a stopper at the same time, with adjustable settings changeable via a small lever in the middle. So, basically, it is installed the same way as the stopper or the splash guards, but a lot of people prefer this option due to its versatility and better aesthetic choices. As aforementioned, garbage disposal machines use an electrical outlet and an electrical switch to operate. A sink top switch is essentially an override that puts a button instead of a switch on the desired place. The most common place to install it is somewhere around the faucet itself. This is a great feature, especially for people with mobility issues. And not to mention that a lot of manufacturers invest a lot in the looks of it, so the customization of your kitchen gets even more options if you consider going with this accessory, which we kindly recommend. When it comes to connecting the dishwasher to the disposal unit, customers` opinions vary from “never do it” to “it is an essential part of the kitchen sink system”. We tested it out on several different models, and there is a conclusion after all. Consider connecting your dishwasher only in the case of it being an old one. Older dishwashers tend to let a lot of the grease and solid waste through, so connecting it to garbage disposal will secure that everything gets ground as it should. Even though we have covered every important aspect of these units in this detailed guide, we will answer some frequently asked questions by the customers, just to make sure to get every little doubt out of the way. The general rule of thumb is to always use cold water. There is no scientific proof that hot water can be helpful in any significant amount. However, when cleaning the unit, especially with vinegar and citrus rinds and peel, hot water can definitely speed up the cleaning process. Just remember: always use water while the food is being ground down, no matter the amount of waste you are putting in. We have touched upon this subject a bit, but to put it in another perspective. There is no definite answer, that’s for sure. It depends on your usage of the kitchen sink, type of food and number of people using it. Now, to help you evaluate and get a sense of reference, consider that an average family of four (2 of those being kids) clean their garbage disposal unit 2-3 times a month. This will prevent nasty smells and the development of bacteria. And, on top of it all, regular cleaning prolongs the life of the unit, so it is a double win for you. We talked about restarting and resetting the unit as a quick fix if something goes wrong. But if that doesn`t help, please do consider to call a professional. 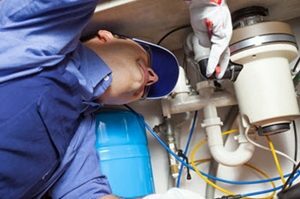 Now, usually a standard plumber will do, just make sure to consult the manufacturer, as they can point you to the licensed repairman or service. Sometimes, with 1 HP units, an electrician is needed, because the motor can make an irregular power surge, so some rewiring might be in order. These machines pack an incredible punch. Do not be fooled by the size of it, or by the low noise sound. They work at a rotation speed of over 1000 RPM, which makes it the most powerful piece of home equipment in an average household. Never underestimate the power of a garbage disposal unit! Which leads us to our next question. Absolutely yes! This powerful piece of equipment is responsible for more than a thousand injuries (most of them nasty ones) of the hand or of the fingers. That is why you should never, ever, clean the disposal with your hand. Use pliers instead, bring it to get rid of some stubborn piece of waste, or to reach something you want to be retrieved. Well, as we said in some of the previous sections, it depends on the usage. The disposals are under the sink and the sound doesn’t get out much. Just make sure that you attach every bolt as it is imagined by the manufacturer. Every loose screw, even on your sink, can mean a lot of vibrations and lead to noisy disposal. Also, consider getting a splash guard to muzzle some of the noise, or maybe some sort of a better suiting adapter. They are affordable and go a long way. If by any chance you got a model that doesn`t have a power cord included in the package, that is your first stop. Fortunately, these are cheap and on the bright side, you can choose one that fits the specifications and size of your kitchen exactly. When it comes to other accessories, there you can experiment a lot, because they are the cheapest when it comes to kitchen equipment. We recommend trying some highly-customizable adapters which can help you achieve your wanted technical results, and help you get a better shine out of your old sink. Well, there’s no denying that using a garbage disposal unit will increase the volume of waste that goes through your pipes. The waste particles might also be somewhat larger than those of the waste you’ve previously flushed. However, this won’t be a problem for most users. If you don’t have any pre-existing problems with your plumbing, you shouldn’t encounter any when you use a garbage disposal, either. If you already have some issues with clogging and sewage back-ups, you should not install a garbage disposal unit until you fix them. So, there you have it, an in-depth analysis of the garbage disposal system. There is a lot to go through, and a lot of information to process. Choosing the best garbage disposal model for your household is not an easy task. Horsepower, type, capacity, accessories, setup, cleaning, and maintenance. Those are just the tip of the iceberg. However, keep in mind that this is not a purchase to be made every year or even every two years. These units are built to last and to serve as heavy-duty kitchen weaponry. We hope that we have answered every question, resolved every dilemma or doubt you had regarding the topic in our unbiased garbage disposal reviews. Deciding is not easy, and we understand, that’s why we are here to test these units out for you and give you our experiences and knowledge that we have acquired along the way.